Get your company noticed by having a website that captures attentions, drives traffic, and increases servings and sales. DMG Computer has the experience to understand your needs and be able to guide you through the repossession of setting up your website. Your business is growing, and your web solutions provider needs to be able to grow with you. We at DMG Computer can grow right along with you, keeping your website up to date and speed with you. You know how important reliability is when it comes to dealing with your customers, and it is important to find a web solutions provider that feels the same way. 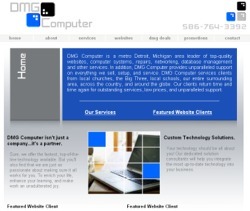 We at DMG Computer pride ourselves on our reliability, promising quick support, and setting deadlines that we keep. DMG Computer offers process servers and process serving companies a terrific way to get their companies online quickly and economically. We designed, developed, and maintain Search-For-Servers.com. Visit dmgcomputer.com to learn more. Copyright 2006-2012 SearchForServers.com / Search-For-Servers.com / Glaeser Enterprises, LLC. All rights reserved. SearchForServers.com / Search-For-Servers.com / Glaeser Enterprises, LLC does not warrant the work product of our advertisers, nor does it share in the fees obtained from our clients. All fee arrangements are between the attorney, creditor, or other business or individual and the process server.